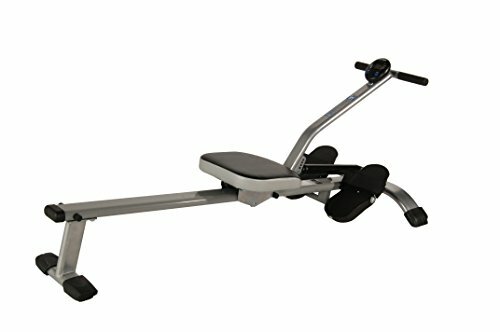 The Stamina In Motion Rower is compact with a small footprint and makes a perfect addition to any home gym. The In Motion Rower has solid steel construction, a comfortable stitched seat and foam hand grips. The oversized foot plates pivot to help maintain the natural rowing motion during your workout. The In Touch fitness monitor will keep you motivated to reach your fitness goals by tracking strokes/minute, count, time, calories burned and will scan all features during your workout. Rowing on the In Motion Rower is as easy as 1-2-3. The continuous, non-impact movement of rowing can be broken down into three phases: the starting point or catch phrase, followed by the drive phase and lastly the finish. In the catch phase, knees are bent with shins vertical and shoulders and arms reaching forward. This phase mimics the point where the oars are being placed in the water. The drive phase is initiated by the legs. As they extend, arms remain straight until the knees are mostly extended, then the elbows flex bringing the oar handles into the upper stomach. In the finish, the legs are fully extended, shoulders are back, elbows are flexed and the oar handle is against the upper stomach. For the recovery, the knees don't flex until after the hands pass over knees as the arms and shoulders reach forward to begin Catch Phase again.